January 25th, 2016. Japanese Digimon fan @freedommon tweeted an image from Thursday's issue of Weekly Shounen Jump magazine, revealing that Mikagura Mirei of Digimon World Re:Digitize and Digimon Story Cyber Sleuth will also be making an appearance in the upcoming Digimon World -next 0rder-. 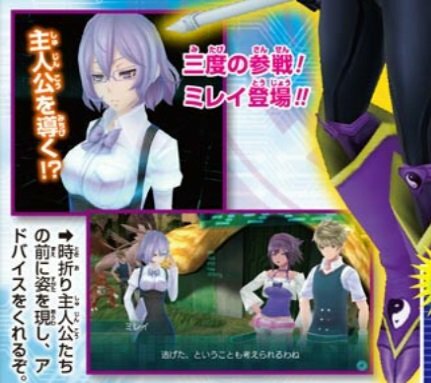 Mirei's most recent appearance in Cyber Sleuth was as the attendant to the DigiLab, assisting the player in that game by helping coordinate certain quests and advising them in raising Digimon. Mirei's role in -next 0rder- remains enigmatic, but the issue states that she appears before the protagonists to advise them. The issue of Weekly Shounen Jump also features Kuzuhamon as a key character, one of two Digimon seen accompanying Tsuzuki Shouma in the most recent trailer.